We would like to introduce you to our electric air freshener unit. 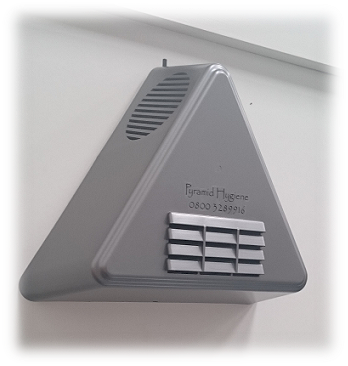 The pyramid hygiene air freshening system is a simple and economical way to keep your facilities smelling fresh and clean. Our units are ideally suited to washroom and changing areas although they have also worked well in reception areas, hallways and occasionally behind bars. We offer a free trial which gives you the chance to evaluate the system with absolutely no commitment. We have a range of fragrances to suit both ladies and gents facilities, which will consistently work to freshen the area between the four weekly services. We at Pyramid Hygiene are committed to reducing our carbon footprint and believe our commercial air freshener to be one of the most eco friendly on the market today. The fragrant gel blocks are castor oil based, so no harmful CFCs, as with aerosol products. The spent gel blocks are brought back to the factory and recycled in the gel making process. The fan blows a steady cool breeze over the gel block. The unit is mains powered, using very little electricity, if the unit was left running for 12 hours per day 365 days per year it would use approx £1.80 worth of power. We believe this is a much better option than having to dispose of used batteries. We are currently developing a new unit that will reduce the amount of electricity down to approx 35p per annum without sacrificing any efficiency.